How much colour, fun and excitement can you pack into an ABC book? Tonnes. ABC is for Circus is exactly what the title says – working from ‘A is for acrobats’ right through to ‘Z is for zebras’, you will meet daredevils, jugglers and snake charmers along the way. 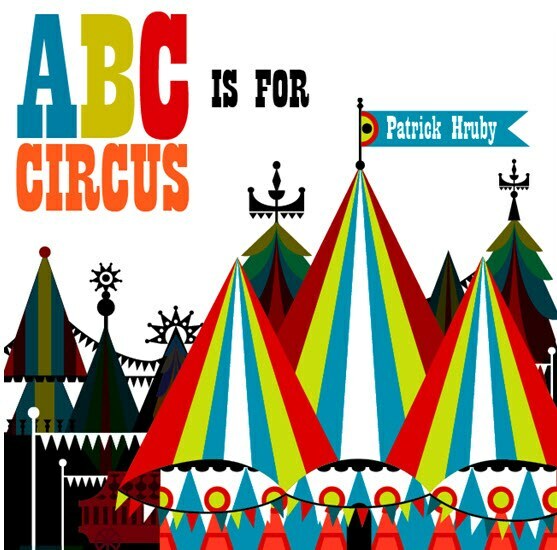 Illustrated by Patrick Hruby, ABC is for Circus is destined to be a ‘must-have’ board book. Each page is packed with bright bursts of colour and chunky geometric shapes – the illustrations pop out, largely because of the careful use of black silhouettes and white space which will be a sure-fire attention grabber for the youngest ‘readers’. My favourite pages are “F is for Fireworks” and “N is for Nighttime” – the fireworks page features beautiful white silhouettes of the big top against a black sky, bursting with colourful fireworks. Similarly, the nighttime page shows colourful stars against a deep blue background with the silhouette of a Ferris Wheel layered over the top – stunning! It’s difficult to describe Hruby’s style. It was somewhat telling to discover that he studied mathematics and physics before attending the Art Center College of Design in California and pursuing a career as an illustrator – geometry clearly influences his work. Personally, the illustrations in ABC is for Circus reminded me a little of Swiss folk art but I’m sure others will look at them and see other influences. ABC is for Circus is available at Fishpond for $14.97. For more beautifully designed ABCs, check our previous posts here.